Todd Marinovich is a tragic story of a person who could not live up to the expectations and accolades that were heaped upon him. I remember the first time I had heard about Todd. It was the cover of a Sports Illustrated magazine with him in his USC uniform proclaiming him as “Robovich”, that I became perplexed by this young athlete. I read the article and how he was born and bred to become a superstar at the next level, and even I myself after reading this magazine thought that Marinovich was destined to be the next Dan Marino. What I didn’t understand like many others was the complexity of problems that were being created for Todd because of his lifestyle. It is no fault of his parents. They wanted the best for him and went of their way to provide the best for him. A divorce however didn’t help things, and Marinovich had begun to experiment in drugs such as marijuana, alcohol and cocaine. 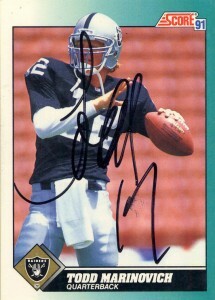 Regardless after a relatively impressive college career at USC, the Los Angeles Raiders would elect to select Todd with their first round choice in 1991. Despite a few games in which Marinovich would flash talent, his drug use escalated as he began using other drugs such as LSD. His 1992 season, while again improving statistically resulted in him striking out of the NFL’s drug rehabilitation program before the 1993 season. Marinovich would shift over to the CFL in 1995 to revive his career playing with the Winnipeg Blue Bombers but this time injury would end his career there before he ever begun. He’d take more time off and receive serious intrest from the NFL in 1999, but would end up with the British Columbia Lions. 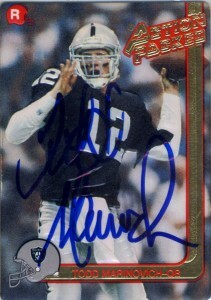 In 2000, Todd would join the Los Angeles Avengers in the Arena league, where he’d have the best moments of his football career leading the Avengers and being named to various rookie teams, but with his drug use never being curtailed, Marinovich spiraled back out of control and out of football for good by the end of 2001. (He’d finish his career in the Arena leagues with 472 attempts, 249 completions, 3214 yards, 62 touchdowns, 21 interceptions, and an 88.5 qb rating.) Truly a tragic sports name, Marinovich has been named as one of the NFL’s greatest draft busts of all time. Marinovich has continued to be in and out of drug treatment and in trouble with the law. He sometimes could be found at some points down on the beaches near LA skateboarding or clearing barnacles from boats. I’d get Todd’s autograph on his Action Packed Rookies card in training camp in 1991 but by his second year his autograph had radically changed to just ‘Todd’.